A weekend of competition, scouting skills, and good food! 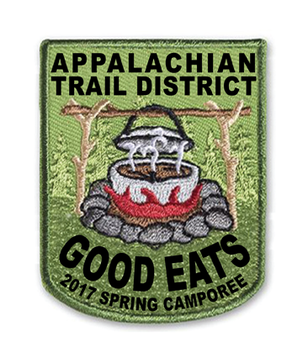 The Good Eats Camporee is the place to show off your troop and patrol cooking skills. Compete in 6 unique cooking themed patrol competitions and win the Golden Spoon Award! ​Practice your utensil-less cooking, cooking first aid, grocery shopping, and pioneering cooking projects to win! Good Eats Saturday Afternoon Demonstrations! Campfire! Award Ceremony and Skits and Songs! - Patrols or troops bring 2 skits and all your props to entertain and be entertained!